Are you looking to add additional space to your room by getting rid of that old dresser? Or, maybe you have a lot of "dead space" inside your closet? Maybe you need some extra storage space for seasonal clothes, linens, etc. 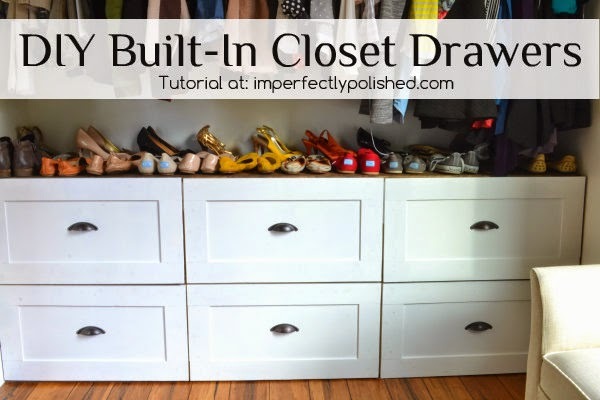 Jessie at Imperfectly Polished has a fantastic DIY tutorial for built-in closet drawers. Click on the photo above to get all the details on how to re-create this extra space for your own closet! Stop by and visit Jessie by clicking here. She has so many great ideas to share and her "home" is always open to visitors!